The vendor really wants to make sure only serious offers get in. First it was a curiosity, then it fetched a crazy price, and then the buyer said 'crazy price? Me? You must be thinking of some other loon' and ran away. 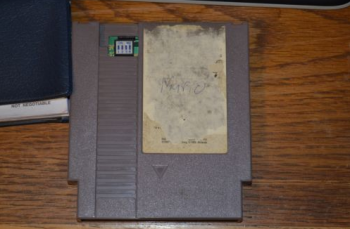 Now the battered grey NES World Championship cartridge is back on eBay, and this time the vendor's put a $65,000 buyout price on it to scare off the crazies. "After many failed Second Chance Offer attempts, waiting a minimum of one day per individual," says the vendor, "I decided to relist the cart with an intentionally steep Buy It Now price while accepting best offers to attract only those who are truly interested. Remember, I'm selling my collection so I intend for this cart to change hands." As you may recall, the last time this one went to market the winning bidder offered $99,902, only to back out once the auction concluded. So, have you got some actual cash in your pocket? Do you love Nintendo beyond all sense and reason? Head over to eBay; there's something you might want to bid on, and it'll be there for the next 9 days or so.